Allah alone is the One Who guides toward the Divine Light. Indeed the noblest of you, in the sight of Allah, are the ones best in conduct. indeed Allah is All Knowing, All Aware. The beauty of knowing spiritual seekers from many different traditions, faith and places is like knowing flowers of many colors in a garden that has no beginning and no end. If humanity is a garden, its blossomed flowers are those people who in their unique way opens towards the sun of divine truth. Diversity in creational landscape is a well established reality. In every aspect we see that this world is created with profound and majestic variety, be it color of people, their language, plant or animal kingdom. Its always a privilege to know sincere seekers who in their own unfolding have found their path through which they discover their inner truth, peace, harmony and relation with the Soul of the Universe. There is no doubt that faith is a grace and a gift. Thus when we come to know how this grace is given to someone, we also participate in that gift, in that grace transmission. In Islamic sacred tradition it is said that "Those who have received faith, are like mirrors to each other". In sharing of seekers journey and their unique way of receiving the grace, our prayer is that may we also partake and receive the infinite reflections of the One Grace as it reflect upon the mirror of the heart of seekers and lovers of God. Meet Radha Fournier, a western seeker from Canada who was drawn to the ancient path of Hindu tradition that helped open her heart. With her gifted voice and awakened heart, Radha hosts Heart of the Islands Satsang, a CFSI Radio Program at FM 107.9 from Salt Spring Island, British Columbia, Canada every Sunday. Radha's radio program's theme is: Finding the unity of spiritual traditions through music and reflections. She play music from all spiritual traditions as well as read from various saints, scriptures, authors, etc. For Radha the radio show is her "heart work" of sharing the unity of all spiritual traditions through music and readings. Heart of the Islands radio show was launched as a result of a sleepless night where I was wondering - how may I humbly serve God or Higher Being or Buddha, or Krishna, or Christ, or the Creator, or Mother Nature or Allah, or whatever you may want to call the Nameless and Formless! So out of the sleepless night, Heart of the Islands Satsang, the radio show on CFSI FM 107.9 was born. I choose this format to share with those who may be interested or who may stumble across the show by accident - to share through music the essence of Spirit. The idea is to find the Unity in spiritual traditions rather than differences. The simple words 'All is One' sums it up so well. We are all inter-connected, we all have a Divine aspect to us that is connected with God. If that doesn't make sense, that is OK too - if you listen long enough it might. Heart of the Islands seeks to find that Unity and present music and reflections from different angles so as to bring Awareness to the Likeness of us all. Radha is blessed to live at the beautiful Salt Spring Island, one of the Gulf Islands in SW British Columbia, Canada. The Island is known for its expansive group of artisans from around the world and is very diverse and prides itself on organic farming, its Saturday market, and community-oriented lifestyle. Radha is a regular reader of this blog and she has been very generous to share with us a glimpse of her fascinating spiritual journey. What follows is a guest blog posting by Radha. Mantras and Chanting are wonderful tools to connect with the Divine. For people not familiar with chanting, the idea of singing “Hare Krishna” can bring back memories of long haired hippies in Saffron robes at the airports chanting. I remember as a young girl encountering the “Hare Krishnas” at the airport, and noticed people afraid of them, ignoring them or turning away from them. But as a curious and innocent child, I liked what I saw. People singing, enjoying what they were doing, and smiling. I thought, what could be so wrong with what they were doing? I was blessed to be raised in a religiously diverse (though not always peaceful) household. This allowed me to be exposed to multiple spiritual traditions, though raised Catholic. Catholicism did not speak to me in my youth, often presenting an ominous, judgmental God and a sense of fear of doing wrong. During the tumultuous years of my teens and early 20s, I went to the extreme of atheist, but not for long, as I always had a connection with Mother Earth. As I aged, my beliefs morphed into agnosticism. Knowing there was something greater, but not willing to use the name “God” as there were so many negative connotations of “who” or “what” God was, that the word didn’t fit what at the time were my beliefs. I knew intuitively there was something greater, but the closest words that fit were “Mother Nature”, the “Universe”, but not God. I had to keep searching before I found peace with the word “God” and the name “Jesus”, amoung others. One of the launching points for my spiritual search began with the passing of my oldest sister, Diana, a being with spiritual depth who left this earth too young and unexpectedly. It was through her passing that my search began of “Who am I?”, “Why am I here?”, “What is this ‘storyline’ I live all about?” Not many years later, other life challenges including two bouts of cancer and the loss of my mother and others near and dear thrust me deeper into the search for meaning in life. Two women who had such a profound influence in my life were of course my mother, Donna, and my sister Diana, both who were on well defined spiritual paths and both having spent a length of time India during their own spiritual searches. They laid the groundwork for the path I was eventually to take. Through them, I was blessed with a fertile growing ground to begin my own search once I was ripened by the experiences of life to begin the growth. For this I have deep gratitude to my mother and sister. Ram Dass was a name in our household since the early 70s - my older brother bringing home "Be Here Now", Ram Dass' legendary book on his experience in India, and introducing the book to my mother. My mother went to a Ram Dass presentation in the 80s and talked endearingly about the experience, so Ram Dass was familiar to me by name since childhood. After my sister's passing in 1997, I was at a book store and found "Still Here" by Ram Dass, and the title captured me as that was one of the questions I was asking myself after my sister Diana's passing. I'm Still Here... why? The book "Still Here" spoke to me and I subsequently attended several Ram Dass retreats in the early 2000s and most recently in December 2010. Ram Dass and his guru Neem Karoli Baba spoke to my Heart. 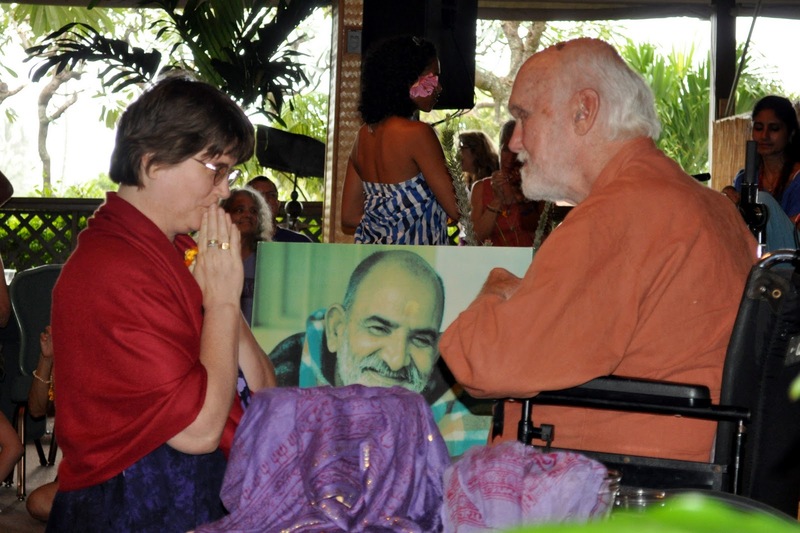 Ram Dass and Neem Karoli Baba are two key spiritual teachers in my life. Being exposed to both Christian and Hindu influences over the years, I was exposed to a wonderful growing ground for my spiritual search. As I searched, I found the Hindu teachings spoke to me most profoundly and fell in love with the Bhagavad Gita, a book that I read over and over. With each reading of the Bhagavad Gita something new is gleaned, something I am supposed to hear at that time in my life. The text so lovingly adorned with notes, underlines and markings of what was important to me at each reading. When I re-read the book, I find new passages that speak to me at that reading – so yet another line gets underlined or marked. "There are as many paths to God as there are souls on the earth." Hinduism also gave me the gift of celebrating a spiritual tradition I had stuffed away and with which I actually held anger for some time – Christianity. I was able to see through the “dogma” of what was preached and find the beauty of the core teachings of the religion. This in turn allowed me to appreciate the word “God” again, and especially the name “Jesus” whose name at one time had no meaning for me but now is a name that brings tears to my eyes. All of this learning, in turn also led me to the search of other world religions and their core teachings. What I discovered was the beauty in *all* religions of the world: God, Amitabha Buddha, Allah, Brahman, Yahweh, the Nameless and the Formless – so many names for the Divine. Aren’t we blessed to have all of these paths to find God? And, yes, there is an underlying theme of all religions. The essence of what I’ve learned in my world-wide search of life’s mysteries is the Divine resides within us – in our Heart. We only need to stop, listen, and feel that connection to the Divine. God is Love. When we get out of our minds and shift our energy to our Hearts, we find God. It is not the story of who we are (or who we think we are), but the connection to the Divine in our Hearts – when we have that connection and live our lives through that connection, then the day-to-day dramas somehow pale, as it is not about “I” “me” and “my”, but about God, Thou and Thy. When we are connected with our Heart and live our lives through our Heart, we become servants of God, as it is the Love that then directs our lives – not the mind or “ego”. Some of the simple philosophies I found through my search are: “Sub Ek” All is One; Thy Will be Done; God is Love; Love People, Serve People, Remember God, and Speak the Truth. These are all very simple, but when living these words in the Truth of one’s Heart, the dramas of life fall away and makes room for the Divine. Peace is found. 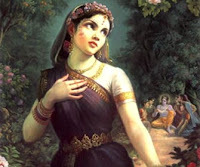 You may connect to Radha via her Facebook. The Last episode of Radha's program Heart of the Islands Satsang can be listened here. May her path and her work be graced.